Form Download - Midway Securities Ltd. - Top Stock Brokerage: Dhaka Stock Exchange (DSE) Bangladesh Share Market. ​Download the form, fill it out and, either email it back to us signed or drop it off to your nearest location to open a BO account. Your document requirements are mentioned here. ​Fill out the Cheque Requisition Form and, either email us your document or drop it off at your nearest location. We will deposit your fund directly to your bank account via Bangladesh Electronic Fund Transfer Network. (BEFTN). 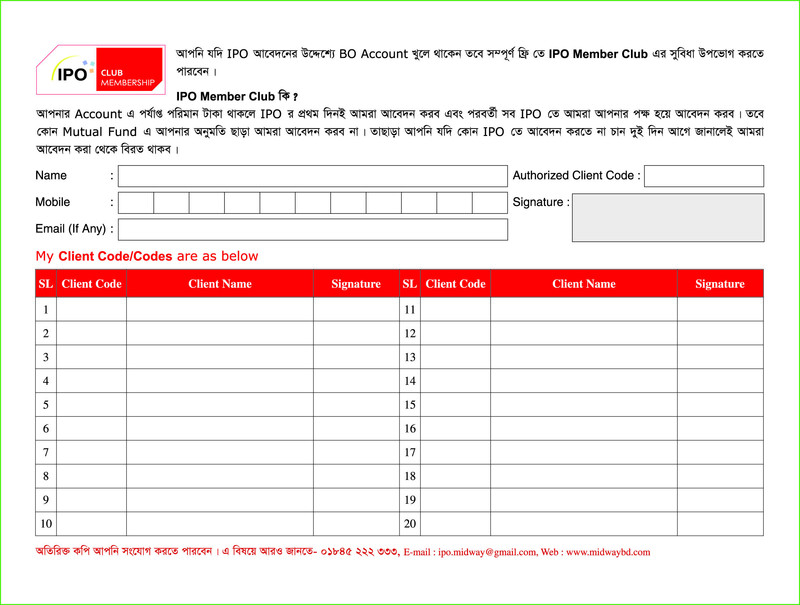 ​​Join our IPO membership club and you will never have to worry about missing an IPO application. We will automatically apply for all the IPOs for you (depending on your available balance). Please be aware, we will not automatically apply for Mutual Funds. Call or visit us to find out more. ​Fill out the DSE Mobile App Registration Form to start trading online, over an Android phone or a desktop PC. You can check your Portfolio, execute Buy and Sell orders, or to keep up with the latest Market News.